WHY DO WE LACK STRENGTH FROM TIME TO TIME? 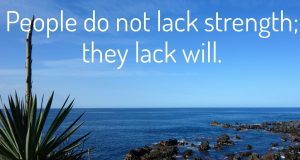 I’ve been thinking – “why do so many Christians lack strength in their daily walk with the Lord?” We know God is our strength and he promises He will fulfill our needs – so why are we negative, struggle and lack strength from time to time? The more I asked God to enlighten me the more I heard the word, “Joy…what IS the joy of the Lord?” The more I meditated and read God’s Word the clearer it became to me. The ‘joy of the Lord’ is all the gifts and talents He has given me. It is all the blessings the Lord has provided over the years, healings, provisions, breakthroughs, and protection…it is even the air I breathe! It is His love for me without condition! No matter what, we all have a free choice to agree with the negative voices or the positive, up lifting voices in our heads. As we focus and draw off of what Jesus has so freely given us – His joy through the love He shows us – that joy gives us strength to live, fight, be strong, courageous and overcome! It’s time to build up our will and focus. When our will becomes determined to allow the Lord to do all He has purposed in and through us we will begin to enjoy a new vitality and strength. Keeping that up and practicing everyday is key!